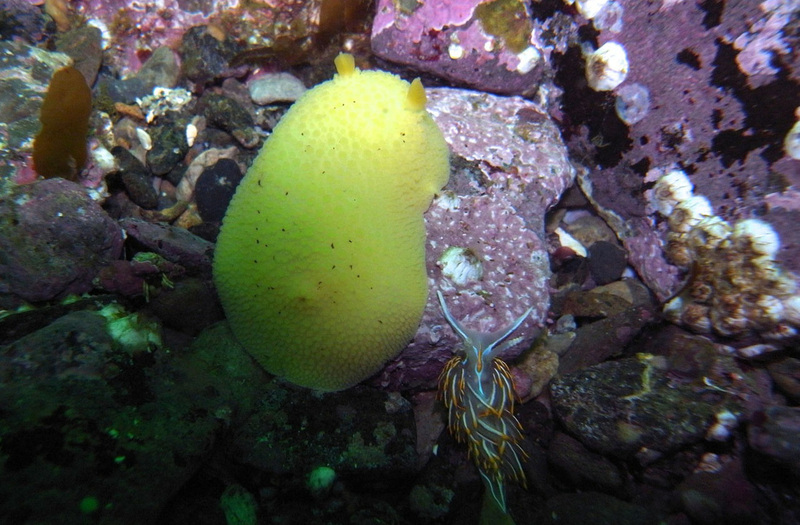 Heath's dorid, pictured here with an opalescent nudibranch, is variable in appearance and can look very similar to the Monterey sea lemon. Photo by Jenn Burt. 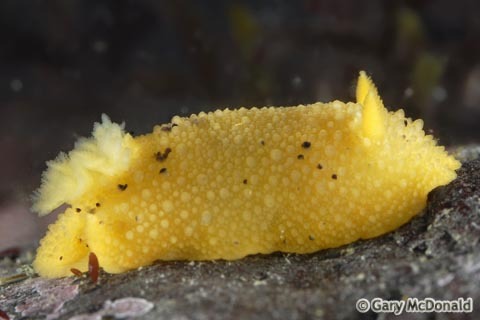 Heath's dorid is an oval-shaped nudibranch with very variable colouring ranging from white to yellow. Its dorsum is covered with small tubercles and sprinkled with tiny dark speckles, which can extend onto tubercles and may aggregate to form light brown patches. There may also be larger dark spots as well. There is often a concentration of these spots just forward from the retractable gills, which are a light yellow to dusky or dirty yellow. The often typical dirty appearance of the gill is created by many small dark specks on the white or light yellow gill plumes. It is usually no more than 4.5 cm long, but can sometimes exceed 6 cm. 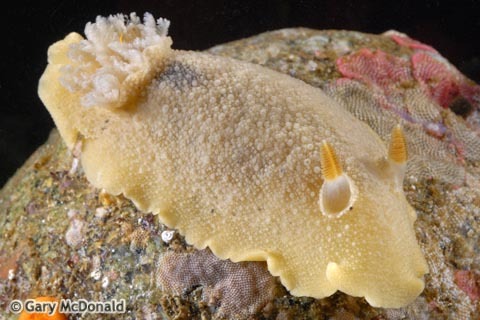 Heath's dorid inhabits rocky areas where it feeds on sponges. It is found in the subtidal to a depth of 20 m, from central Alaska to northern Mexico. It can be difficult to differentiate this species from the similar and also variable Monterey sea lemon (Doris montereyensis) and noble sea lemon (Montereina nobilis). The latter is easiest to distinguish, as its dark dorsal spots are only found between rather than on the tubercles, which are larger than those of Heath's dorid (photo). It also has white gill plumes, and gives off a lemony scent when handled. 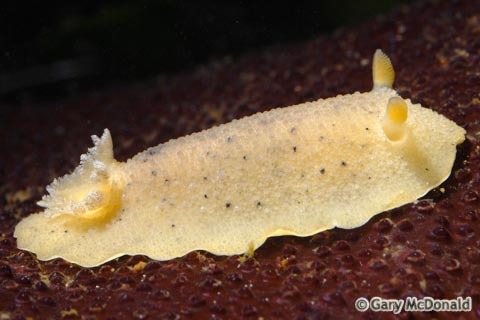 Distinguishing between the Monterey sea lemon and Heath's dorid can even stump those experienced in nudibranch identification. While Heath's dorid can often be identified by its dirty-coloured gill plumes and aggregation of tiny dark speckles anterior of the gills, the variability in this species means these typical attributes are not always present. 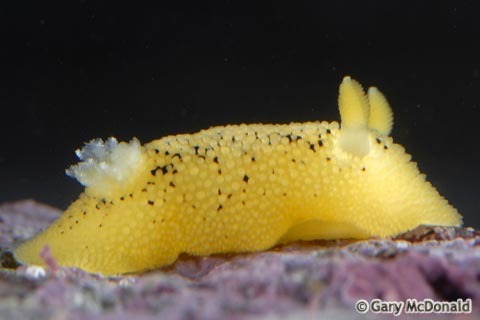 In such cases it may be necessary to rely on other more subjective characteristics, such as the relative sizes of tubercles and dark dorsal spots (both are larger in the Monterey sea lemon). The Monterey sea lemon also gets to a larger size. See the resources linked below for further identification assistance. Harbo, R. M. (2011). Whelks to whales: Coastal marine life of the Pacific Northwest [revised]. Madeira Park, BC: Harbour Publishing. P. 149. McDonald, G. Geitodoris heathi (MacFarland, 1905). Intertidal Invertebrates of the Monterey Bay Area, California. Long Marine Laboratory, University of California, Santa Cruz. Accessed 19/020/2015. Rudman, W.B. (2000). 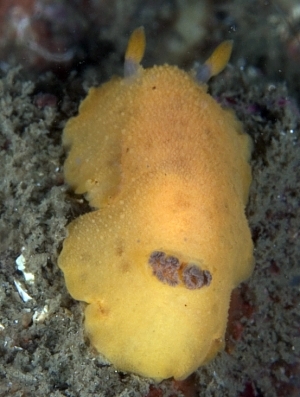 Geitodoris heathi (Macfarland, 1905). [In] Sea Slug Forum. Australian Museum, Sydney. Accessed 19/02/2015.